Today is one of my favorite days of the year, and in honor of Halloween, I present my personal list of the top 10 scariest movies of all time, published on the Dark Moon Digest blog [click here]. As an added bonus [and also in the spirit of Halloween], I include 13 more horror films that narrowly missed the cut. Check it out...I welcome feedback on the list I've compiled! Short story accepted for new vampire anthology from Rainstorm Press! I'm pleased to announce that my short story, Meat, has been accepted for inclusion in the anthology, Thirsty Are The Damned: A True Vampire Anthology, published by Rainstorm Press. Meat offers a ghoulish, startling deviation from popular vampire themes in contemporary movies and literature. 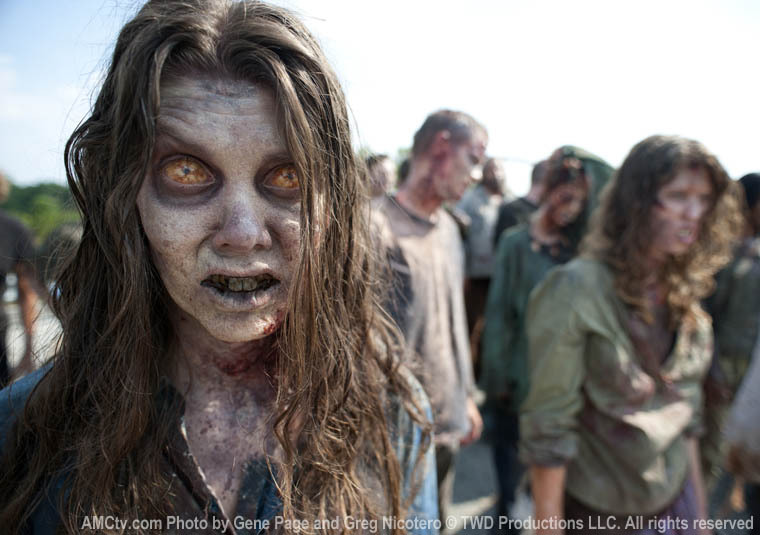 For horror aficionados who can't think of a better way to celebrate a Sunday evening than with flesh eating zombies, make sure to catch tonight's season premiere episode of "The Walking Dead," on AMC [9 PM EST]! This groundbreaking series paints a nightmarish vision of the world as it exists post-zombie apocalypse, and what the unfortunate survivors are willing to do [even to each other] to ensure their continued survival. I'm pleased to announce that over the weekend, this website eclipsed 1,000 page views! Not bad for the initial three months of the website! Although this is a fairly "small" initial milestone, it's a meaningful one to me, since I use this website to highlight my platform of work. My thanks go out to everyone who's visited and continues to visit this site, helping to keep it vibrant and alive. I encourage new readers to respond to the blog updates I make--I love hearing feedback! I've got a lot of great stories in the pipeline, so stay tuned for new updates about upcoming publications! So, you've just put the finishing touches on your story. You've worked hard to commit the right words to paper, toiled through the laborious editorial process, and incorporated feedback / improvement suggestions from readers you trust -- all in the interests of making your story publication worthy. Now comes the hard part: finding the right market to match your work. Enter: Static Movement. Spearheaded by founder and lead editor Chris Batholomew, Static Movement offers both a monthly eZine as well as an unbelievably diverse array of open print anthology projects. Whether your preferred genre is horror, sci fi, fantasy, steampunk, or anything in between--Static Movement has dozens of anthologies that are open for submissions and might be a good fit for your story. Check out they're open projects here for more information!